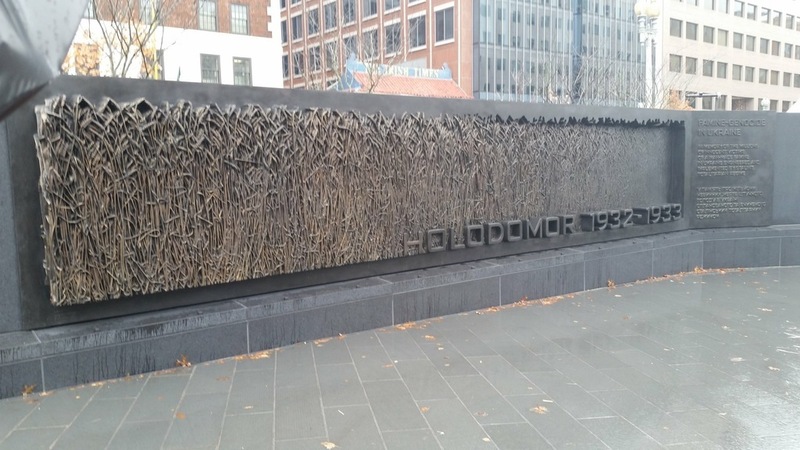 Holodomor (dedication and blessing of the Holodomor Memorial in DC). Background info: the Holodomor (i.e. murder by starvation) was an intentional policy of the USSR under Stalin. In 1932-33, the Soviet regime killed upwards of ten million people (the number is disputed, but no one doubts that it was several million) through the forced acquisition of their harvests, “seed corn”, food, and livestock; forbidding anyone to provide them aid; and prohibiting anyone from moving away. 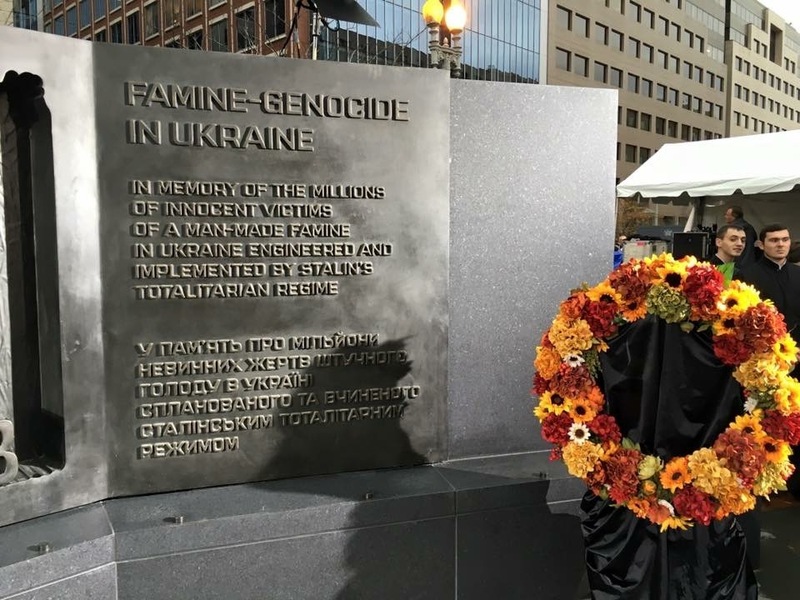 On Saturday, November 7th, I joined thousands of people (mostly Ukrainian-Americans) in Washington D.C. for the unveiling and blessing of a monument to their suffering and the resilience of the Ukrainian nation. Death by starvation is incredibly slow and painful; it is an offense against humanity and a sinful violation of the natural order that God created “good”. The death of ten million people in less than two years is an event that is too terrible to comprehend. The fact that these ten million people died by starvation … there are no words that can describe the magnitude of the pain and suffering those human beings, our brothers and sisters – many of your blood relatives – went through. And what of those who survived? Such a trauma leaves a mark on the psyche and on a culture that casts its shadow even to the present day. There are three points that I would like to bring out today. 1. This horror happened. As humans, we have to know such things. Ten million people died a slow and terrible death, knowing that there was plenty of food. The resulting anguish was physical, mental, and spiritual. I cannot speak of the magnitude of this suffering. The ways the starving body and mind are well understood; so too is what it does to the culture of families and nations. But, as with medical descriptions of Christ’s suffering on the Cross, these would be too sterile to capture the true essence of what happened. There are many diaries and letters preserved form this time. I have read some of them and encourage you to do the same. It was horror on a grand scale. 2. This horror was avoidable. Like Lazarus in the parable of the Rich Man and Lazarus, these people dried up and died in the shadow of those who had plenty. This is part of the horror of 1932-33. Ukraine had the best earth on the planet. There was enough food. The second inescapable fact – a fact that is as incomprehensible as the first – is that the suffering and death of these ten million people was done intentionally. That means that it was not “just” suffering and it was not “just” death: it was torture and murder. This was not the result of terrible weather or bureaucratic mismanagement: it was a policy designed by the Soviet regime to destroy lives, a policy that was consciously ratified and reaffirmed by everyone who enforced it throughout that time. These people were worse than the Rich Man in the parable: they did not just walk by him and disregard his suffering: they took the food from the man’s plate, tied him to the ground, and tortured him – and then they did the same to millions of his family members and neighbors. It was part of an evil plan conceived by an evil regime that had no love and no compassion, a regime that reveled in hate and misery. It hated God, humanity, and creation. It was the anti-Christ incarnate. How else can you explain the blasphemous history of the Soviet Union? 3. These things, the reality of the suffering and the evil intentionality it, are BY FAR the most important part of the reality of the Holodomor. Everything else – our attempts to explain it, and especially our use of it to teach lessons (even moral ones) or score political points – pales in comparison to the visceral and gut wrenching knowledge of such pain and suffering … and of such evil. Things like the invasion of Ukraine are bad enough on their own; there is no need to use the visceral impact of the Holodomor to make that point. When we do that, the Soviet Union, like an evil poltergeist or evil lich, continues to haunt and enslave us. How do we face the Holodomor? What is our response to suffering and wickedness on such an enormous scale? Our only reaction after being hit with this is to fall down on our knees and share our love and compassion by praying for their comfort, the forgiveness of their sins, and their blessed repose in the bosom of Abraham. As for the ten million souls that perished in the Holodomor: may they rest in the bosom of Abraham, where there is no pain or sorrow – AND MAY THEIR MEMORY BE ETERNAL!